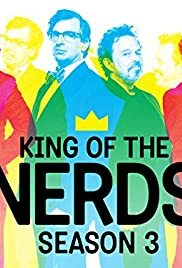 With $100,000 looming and the title of King of the Nerds drawing nigh, the remaining Nerds find themselves thwarted by an Alien Queen - with one observant Nerd finding a key stratagem in Nerdvana. Acid melts the face of a Nerd, while another must play Games with a capital G to win in this double-elimination episode. Hosted by Curtis Armstrong and Robert Carradine.